SEO. Social media. Websites. Blogs. Developing an effective content marketing strategy can feel daunting with so many options and strategies available. At Marketing Insider Group, we meet with brands on all points of the content marketing journey. From those who are still learning what content marketing is and why it’s important to those who are implementing their campaigns and need guidance, we help brands develop processes that allow them to effectively reach their customers. 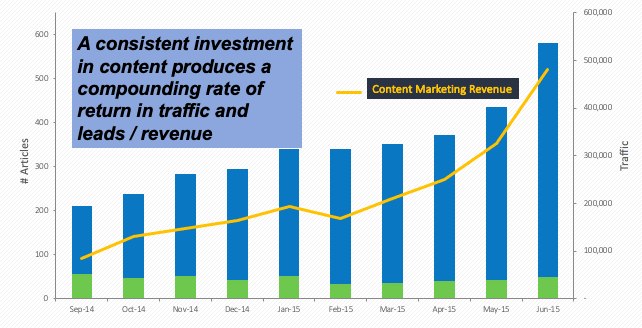 The use of content marketing continues to grow. Over 80% of marketers are intently focused on creating content that builds brand loyalty. Content marketers should focus on solving their target audience’s problems. Connect with your audience on platforms where they hang out. 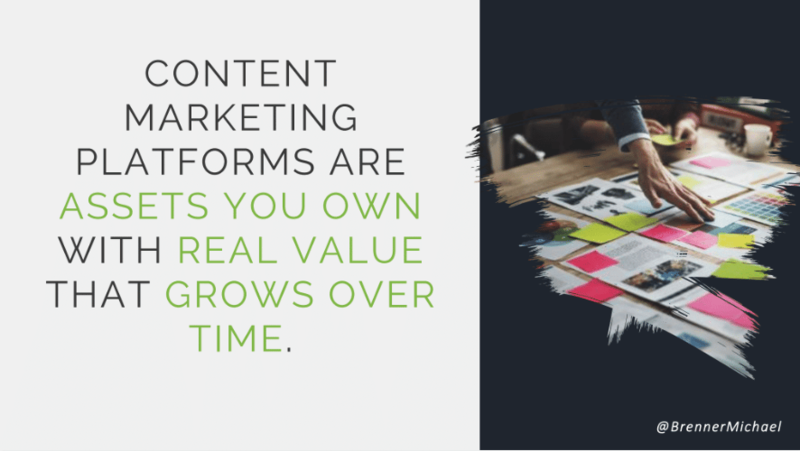 Create content in formats that they prefer to consume. Brands need to recognize that employees are their most powerful marketing resource and figure out how to activate them. An effective content strategy involves data, brainstorming, alignment with the consumer journey, and constant monitoring of key metrics. As many brands have figured out, content marketing is critical to a brand’s survival in today’s economy. 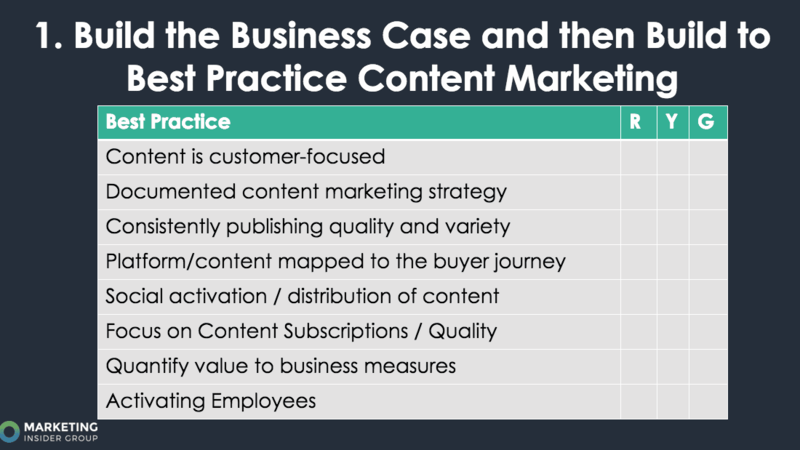 Content Marketing Institute’s 2019 Benchmarks, Budgets, and Trends announced that 81% of marketers report their organization is focused on creating content that builds loyalty. 74% percent of marketers say their campaigns were more successful compared to one year ago with 57% expecting their content marketing budgets to increase. Respondents indicated that the more their content marketing matures, the more likely it is to succeed. 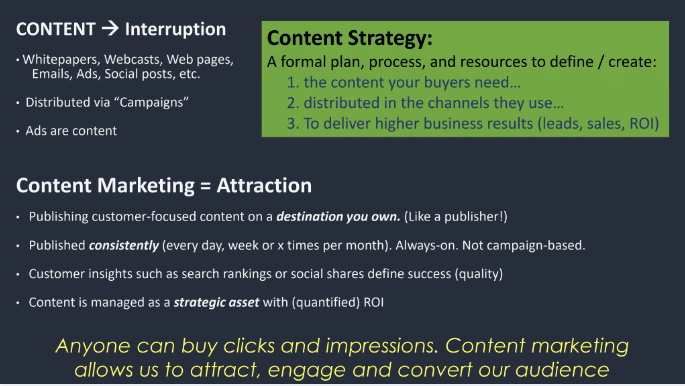 One thing is clear: content marketing is a marathon, not a sprint. We are here to help you and your brand get to the finish line with loyal customers whose needs have been met. How we think about and approach marketing has shifted in the past decade. 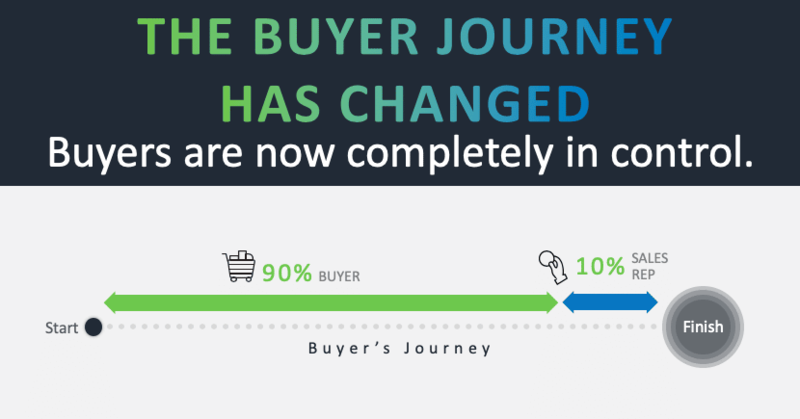 Buyers are now completely in control of their purchasing journey. It’s up to brands to fulfill the consumers’ needs with a seamless, quality experience. 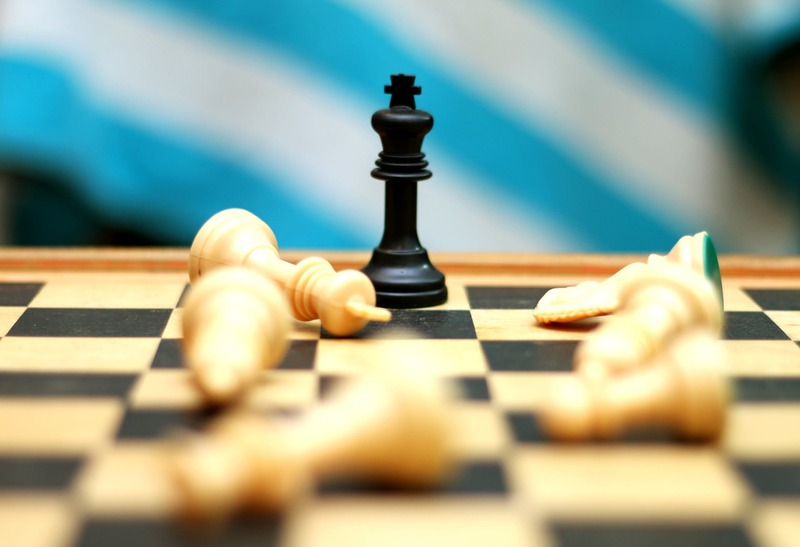 However, one thing has not changed: defining the objective of a content marketing campaign. In short, where is the brand now? What is our mission statement? Who are our current customers? How much budget do we have to spend? Since the buyer is now completely in control of their experience and has high expectations of the brands they’re willing to build relationships with, understanding the buyers is critical. It goes far beyond the traditional basic data like age, gender, race, income level and location. In content marketing workshops with clients, we always consider various other factors that may contribute to a person’s decision to buy a product. Are they happy in their lives, both personally and professionally? What frustrations are they currently experiencing? Where do they get their information? What are they curious about? The list of possible questions is extensive but it helps us begin to build the framework for a successful content marketing campaign. 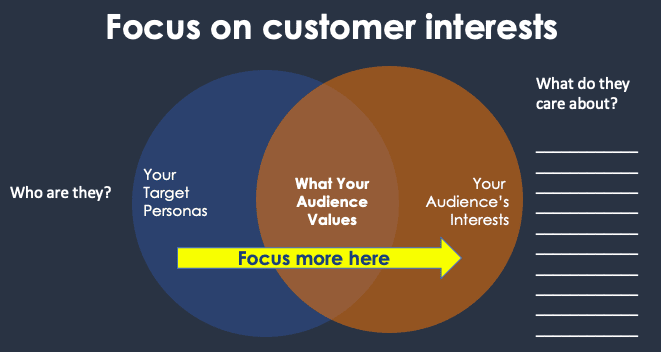 Defining where and how your target audience consumes information frames where you will be publishing content. We’ve noticed some confusion when it comes to platforms. We don’t blame you! There are at least a dozen social platforms that millions of people frequent. Add to that the scores of content management systems that you could build your hub with. It’s easy to get lost. However, we place the most value in the location where a brand can own their content – just look at what the best in content marketing are doing. While they are a great place for content distribution, the constant flux in social media algorithms and user agreements make them an unreliable platform to build a content marketing strategy. Next, we identify the best way we can work with you and your brand. This process includes defining how we will ideate, approve, create and publish your content marketing campaign. For some clients, this is a relatively simple process. Others have required additional steps set by law or previously defined internal procedures. Then we built out topics around these themes, such as tools to use or how to use video in your content marketing strategy. How these articles are actually written depends on the topic but the content may include general articles, lists, how-to articles, infographics and why posts. Part of building an effective content strategy includes brainstorming. We collaborate with our clients to explore the various ways we can reach your target audience. It can be (and in my opinion, should be) one of the most fun parts of the process. We implement tactics such as design thinking where each individual comes up with a list of ideas and then the group categorizes them. Don’t worry, analytical types. We use data-driven tactics to brainstorm. Google is one of the first places we start. It provides suggestions based on the volume of searches done for a topic. AnswerThePublic is another great resource to categorize the most frequently asked questions around a keyword. 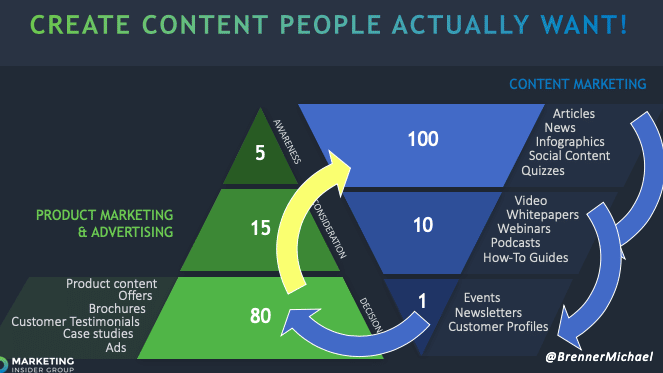 BuzzSumo helps us identify content that has performed well in a specific time span. We are able to look at our own content as well as what competitors have done that’s worked. The platform also enables us to find high performing content by topic. 7. 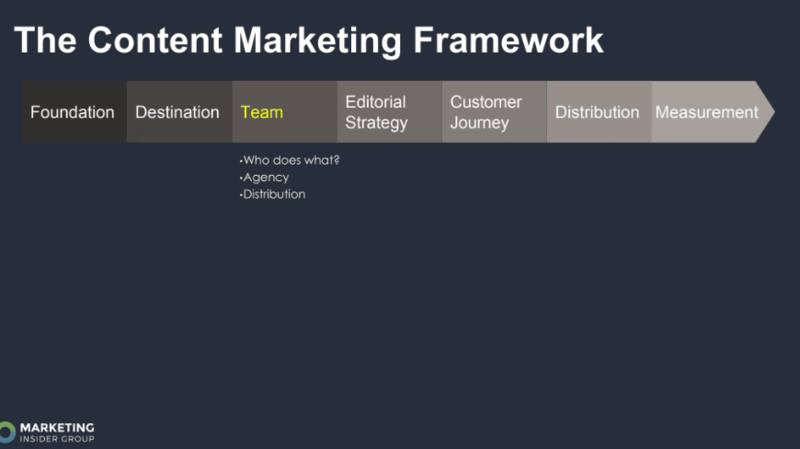 Consumer Journey: Where Does the Content Fit? The journey to reach a consumer who has never heard of your brand is going to vary from the consumer who follows you on social media. We work with brands to determine what demographics should fall into the three stages: early, middle, and late. This stage also determines the frequency in which we create or repurpose content and how we reach the consumer (blog posts, email, social). 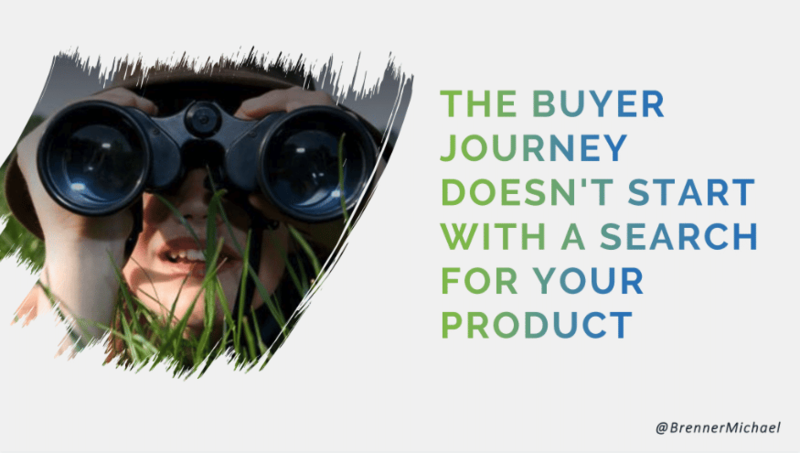 One thing we always have in mind: buyers are not searching for product specifically. They are looking to solve a problem. Your content marketing campaign has multiple platforms to choose from: website, social, podcast, video, paid advertising, and employee activation. It’s here that we work with our clients to help determine which tactics will best help reach their goals. We encourage the brands we work with to look within when deciding the best way to promote their content as their strongest marketing tactic exists on the payroll: employees. When employees share their employer’s content, it can generate up to 8 times more engagement and increase 14 times more brand awareness than brand-only content. Research indicates that for every one buyer, there are 100 pieces of content produced. This statistic makes measurement a key component of a content marketing strategy and is also most likely where your CEO will be most interested. Early in the process we help brands determine what metrics need to be monitored depending on their goal(s) and buyer stage and provide them with a dashboard to help keep track. Our reporting schedule varies but is optimized to ensure a brand has a successful content marketing campaign. How Can We Help Your Brand Succeed In Content Marketing? For as much as I have helped brands create successful content marketing campaigns, I truly enjoy the discovery process because I learn something, too. Whether it’s working to get past an internal hurdle or reaching an obscure target audience, we’re here to help brands succeed! Curious about how we can work together? Contact us today!